Looking out across Honokowai Beach Park. A great family area. 'Aloah' and welcome to Hale Kai! Your home by the sea. 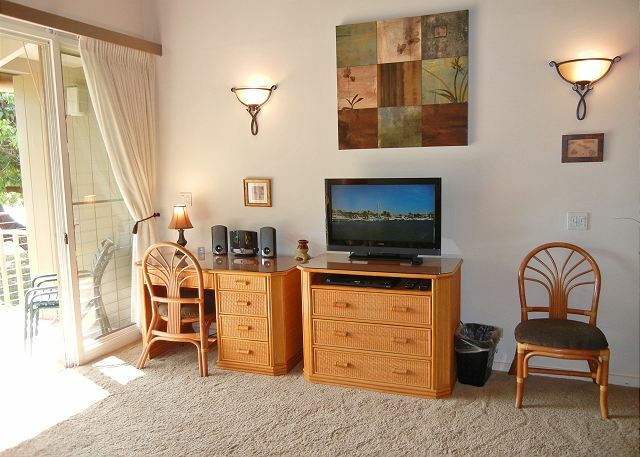 Our recently renovated and replenished seaside condo features a good view of a park and the ocean. Inside is everything you require for a pleasant vacation. For your entertainment there is a 32” LCD TV in the lounge, where you will also find a convertible sofa bed providing extra sleeping accommodation. In the bedroom you will find a king size bed, black out curtains and ample closet space. 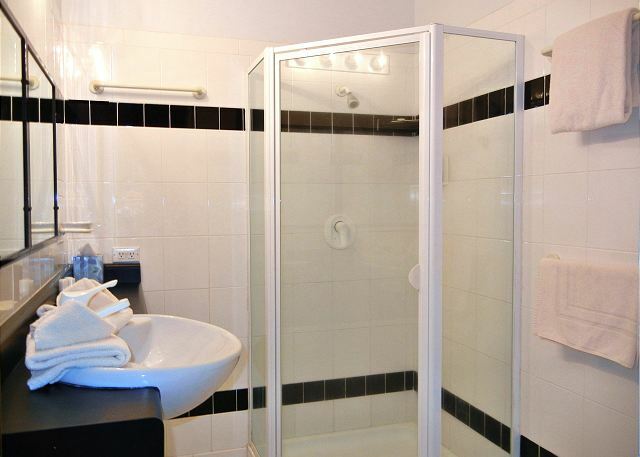 The spacious bathroom has a walk in shower and air that is continuously renewed with an extractor fan. The open plan kitchen features ‘Corian’ countertops and a new ceramic cooktop and oven, and is fully equipped for ‘home’ cooking. 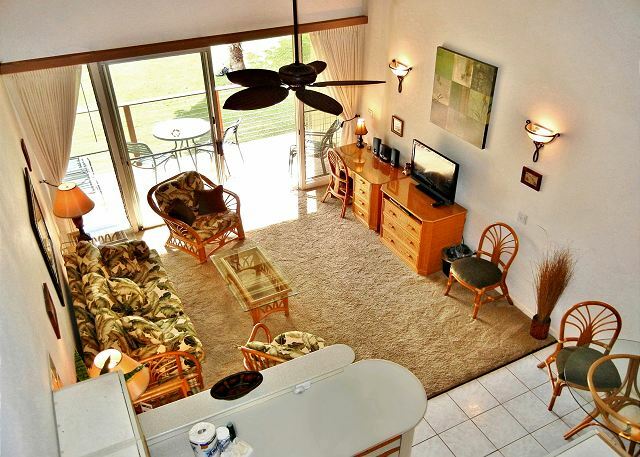 The lounge and kitchen have a direct view of Honokowai Beach Park, and from the lanai, a view of the beach and the ocean. Lastly, to minimize its impact on the environment, our condo is not air-conditioned, rather it features earth-friendly ceiling fans to maximize the cooling sea breezes when necessary. See our Photo Album from our last trip to Maui. balcony, the general condition of the unit, and very helpful staff. 40 years of the Hale Kai! We have been staying at this vacation rental for the past 20 years. Always a wonderful experience. Will return again. Love this place. Hale Kai is home away from home! 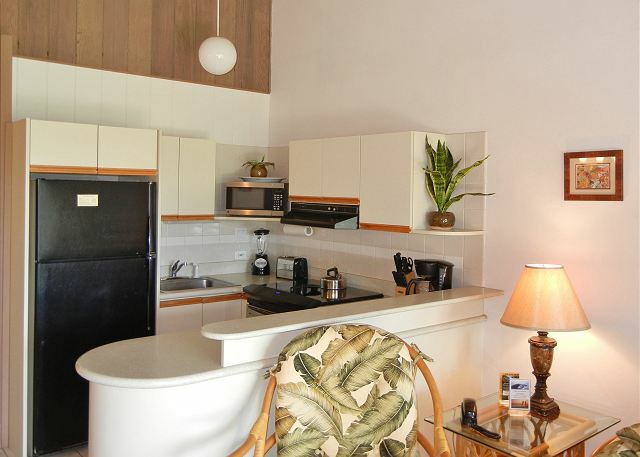 We love staying at Hale Kai and have now stayed in several units including this one. 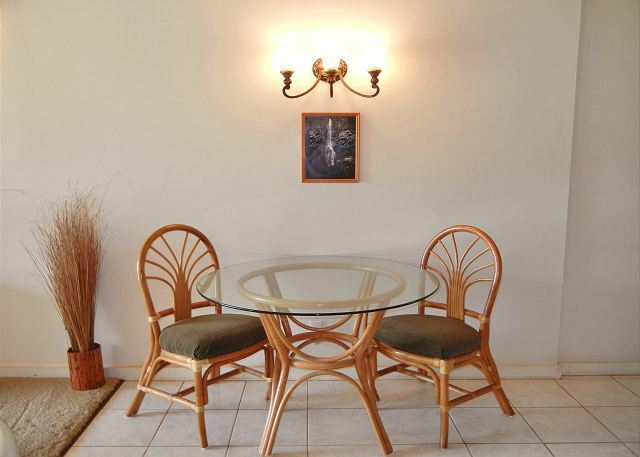 The location of this unit is beautiful overlooking the park and views of the ocean. Heavenly! The unit itself is nicely laid out. Not fans of the washroom door preferring a quieter, private, easier to open, door. Love to see all tile in the unit. Can't say enough about the staff at Hale Kai. Everyone from the cleaning team, the maintenance manager, the recycling gentleman, the office staff to everyone else including the condo owners who live there - everyone is friendly and helpful. They really keep the place going. And Valerie...she is lovely, professional, exceptional, runs the office with her staff so smoothly. She makes the difference to our stay every time...and makes us feel like family. We are all so lucky to have her! We had a lovely time staying here. A wonderful location and close to everything as well as day trips. Only complaint was that the pull out mattress was very thin and you could feel the springs, not very comfortable. We pulled down the air mattress from the loft area upstairs and used that for our son the whole time. We will likely stay here again. 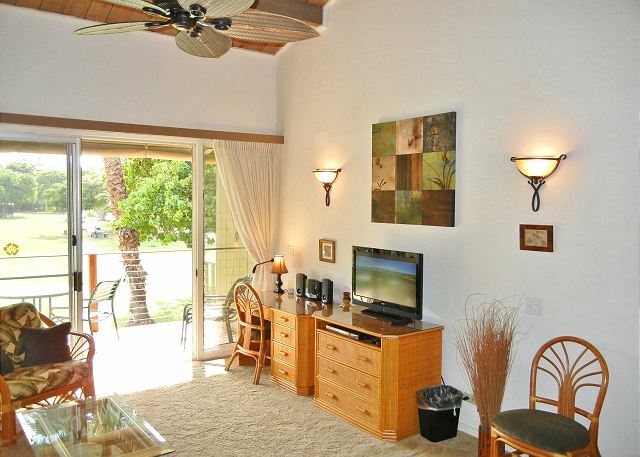 The condo is bordered on one side by a public park with a great beach for snorkeling. We swan with sea turtles every day. Our deck for the week overlooked the ocean and the 2-3 acre park where families would gather to eat and enjoy the beach. We liked this quaint feel of a "local" setting. The neighborhood had excellent local mixed plate food. Not too touristy. We heard music every night, which was never too loud, and we fell asleep to the sound of the surf. And it was the most affordable condo we could find. We had friends staying at a resort to the south, and they said the next time the come to Maui, they will be booking at Hale Kai. These condos are great. This place feels like visiting family. Very welcoming staff and total ease of check in. All of the things you need to know are there including internet instructions. Our unit's balcony overlooks the park ad was a perfect place to spend a relaxing morning. The neighbors were friendly and helpful. The beach was great with lots of reefs to explore. A highlight was seeing turtles and whales just off shore. As always loved our stay at the Hale Kai. Nice to have a Maui Ohana to come home to every year. Fantastic trip again! We stayed in hale kai before and just love the complex! Everything is close, my kids love the park and the calm tidepool section on the ocean. The only complaint is that the pictures of our particular unit were vague. We had no idea that the bathroom was literally in the master bedroom. This was a challenge with kids because they regularly were coming in and out. From booking to checking out, everything went so smoothly. We loved staying here. It was perfect for me and my husband. It was close to everything we needed and wanted to do. We will definitely be coming back. We really enjoyed our stay at hale kai.most of our time, we spent in the flat, we have been on the balcony. nice view over a little beach parc an the sea. The flat itself was clean and we felt good. thanks to valerie, for helping and answering our questions, if we had some. Die Lage der Wohnung ist ausgezeichnet. Der Pool und der kleine Privatstrand machen das Ferienerlebnis besonders reizvoll. Im Meer kann man sehr gut schwimmen und das Schnorcheln macht viel Spaß. Als Ausgangspunkt für Ausflüge ist die Wohnung strategisch gut gelegen. With Hale Kai, location is everything. 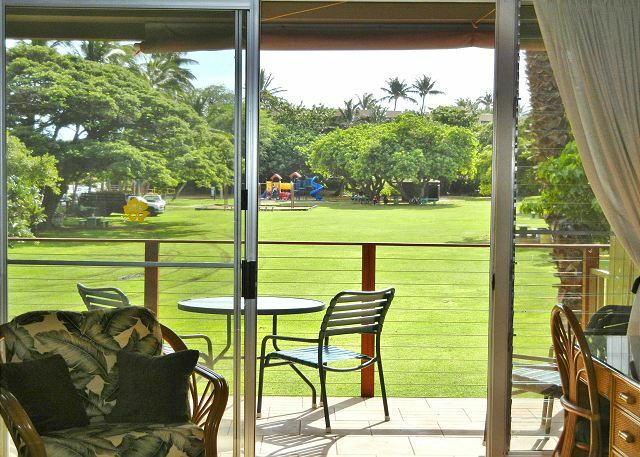 A family friendly park and kid friendly beach is right outside your lanai. The unit is clean, comfortable and spacious. The full kitchen is well equipped. No AC, but the trade winds and ceiling fans in every room kept the temps comfortable. Opening windows in the bedroom at night kept us cool and allowed us to hear the calming sounds of the ocean. Morning coffee and watching the sunsets on the lanai was a lovely treat. My only recommendation would be to remove the tired carpeting. Bare floors or tile would add to the breezy island feel. Kitchen needs updating, but overall, our stay was relaxing and we will return. Property management was responsive and friendly. 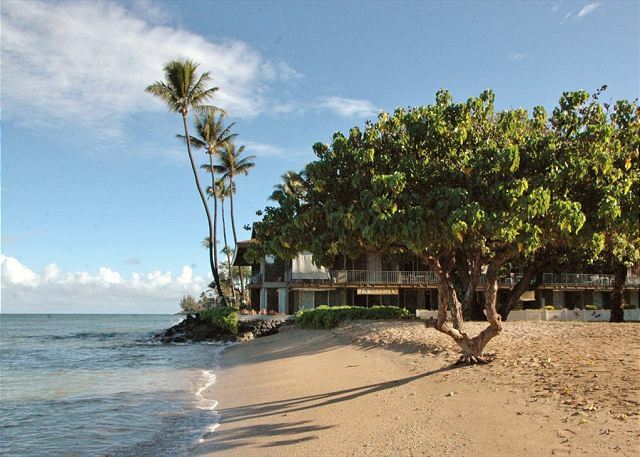 Hale Kai is a great alternative to busy resorts--much quieter and calmer. Mahalo, Valerie, for the welcoming box of Macadamia Nut Chocolates! Natalie M from St-Sauveur, Quebec does not recommend this vacation rental. It was our 2nd year in a row staying at Hale Kai and everything was fine, except that we were quite disappointed with our unit... when we arrived, we noted that the kitchen's cabinets were all greasy, the counter as well... I had to wash all of the dishes as they did not look clean... as my son travels with us, he had to use the sofa bed which mattress was so uncomfortable that he had to pile up cushions on top of the mattress in order not to feel the springs in his back.. anyway, next yar, we would like to rent the next door unit, #205, as we visited it while there and we found out that there were 2 real beds with 2 bathrooms and that the unit, all in all, was much nicer, cleaner, brighter than the one we stayed in. Our stay was wonderful. 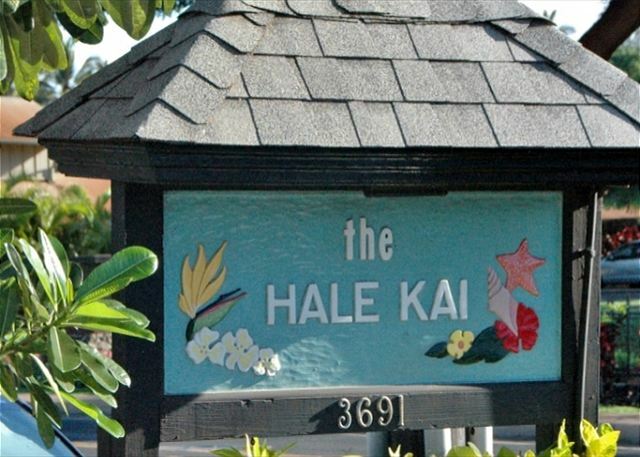 We have stayed at the Hale Kai for the last 17 years and would go no where else. The office staff is excellent and always accommodating. Valarie makes sure we are well taken care of and will go out of her way to help with any requests we might have. We love Hale Kai! This is our second time staying there, and having been around the island, we still agree it is the best place we have seen. The unit is so close to the ocean, and the park. The pool is great. The complex has a great sense of community. There was even a nice welcome gift when you arrive. We were a little short on supplies (towels, blankets, dustpan), but the office gave us more when we asked. The unit also doesn't have quite as many pantry supplies or water supplies as most other units (usually when you rent a condo, the fridge is full of condiments, etc other guests have left behind, but this one had almost nothing--just salt, pepper, and vinegar). There was one snorkel set, but no boogie boards or sand toys like there usually are in Hawaii. Recycling I would note is available in the complex, but there is no bin in the room. Great location - beach, pool, and park right outside the door! Stayed here with my husband and 1-year-old. The property is clean and has a great onsite laundry room with a mini library where people have left their old books and magazines. The property felt a little older and could probably use some updates but overall it was a nice place. I could hear the ocean waves while sleeping--I loved it! 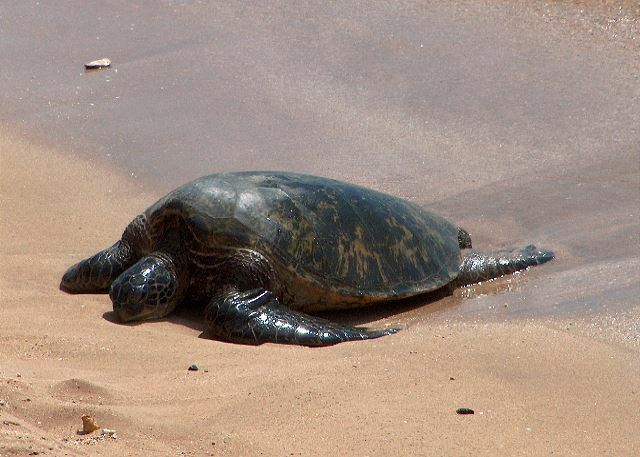 There are also a few large sea turtles that hang out at this beach which is awesome to see. There is an organic food store across the street which we shopped at a lot; our kitchen was equipped with all the right cooking utensils/pots/pans. Unit 206 has a small loft that doesn't really serve much purpose except that our 1-year-old did sleep up there in his pack n play. 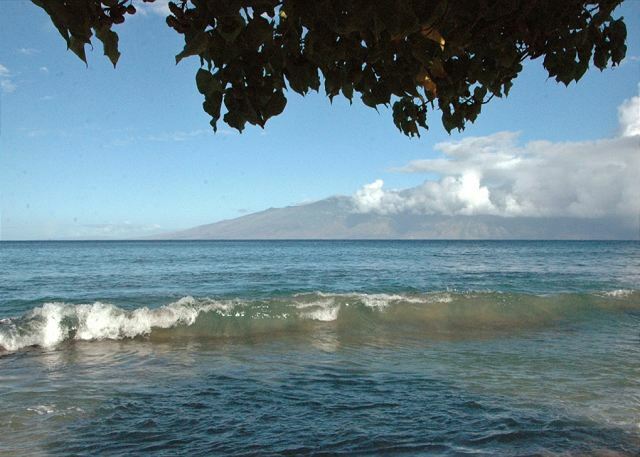 Some great beaches for swimming are nearby at Kaanapali. I would recommend this condo as it was a good price for a beautiful location, but just know that it's not as nice as four-star hotel, but it's still nice. The property/condo was very clean, stocked with everything we needed! Awesome to have laundry on site. The shower was a little awkward/small and had a small leak at base of window on one side. Kitchen and appliances were great! Valorie was super friendly and helpful. Would recommend and stay here again!! Clean and big rooms and a good kitchen with everything you need for cooking. 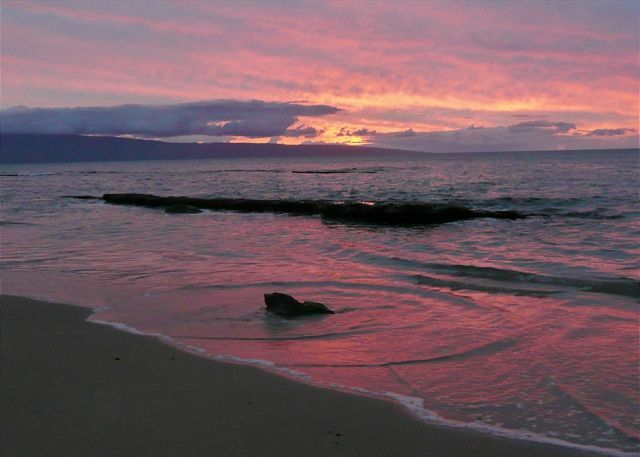 Good location and very close to the best beaches in Maui. I would book it again. Rental staff/ management were accommodating from reservation and all throughout the stay, they are nice and wonderful people.great location an ocean front property, just beside the county park good for children, very close to supermarket,restaurants and near the bus stop. I love returning to our Hale Kai home every year. You couldn't ask for a more relaxing time. 206 gives you the best of both worlds. The ocean view and the park. This unit was clean and well equipped. We do most of our cooking in the room and there was nothing missing in the kitchen to prepare our meals. We have recommended this property to many of our friends and they loved it. The year round residents and owners are very welcoming. I never felt like a tourist! From the moment you get on the property you are aware of the waves: rolling, soothing, calming . The property was well decked out, we lacked for nothing. Great place, clean, spacious right on the beach;highly recommend! We had a fantastic week and location is just great if you need so me quite time. We had a great time there. The people were real friendly. Place was clean. The pool was right on the ocean so we enjoyed many sunsets there. The location couldn't have been better. We could walk to the farmers market, coffee shop, fish market, and snorkel shop. Very convenient for shopping and beaches. Would stay there again. It was exceptional. Everyone friendly, rooms clean & decorated nicely. Priced affordability . Would recommend to family & friends. Upon getting home we discovered my daughter has cancer. Thank you for making our mom-Daughter trip even more meaningful in hindsight. We always enjoy our stay at Hale Kai. Valerie was very helpful especially when the water in our building was turned off unexpectedly . We really enjoyed our stay here. The place was clean and comfortable. The beach out front was absolutely perfect for our 2.5 year old daughter. We visited lots of other beaches in the area but came back to "our" beach every day. Overall we had a great experience. The location to the park was very nice. Location to other thinks like shopping and eating was also very good. The only fault I could find with the place is that some of the owners are not so friendly. Also the bathroom especially the floor needs a deep cleaning. 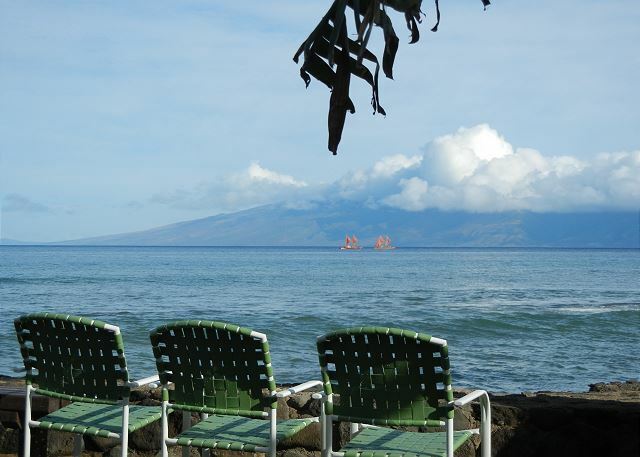 We have vacationed many times in Maui and stayed in many places. This was our 4th stay at the Hale Kai, the first in this unit. # 206 was very comfortable and clean. 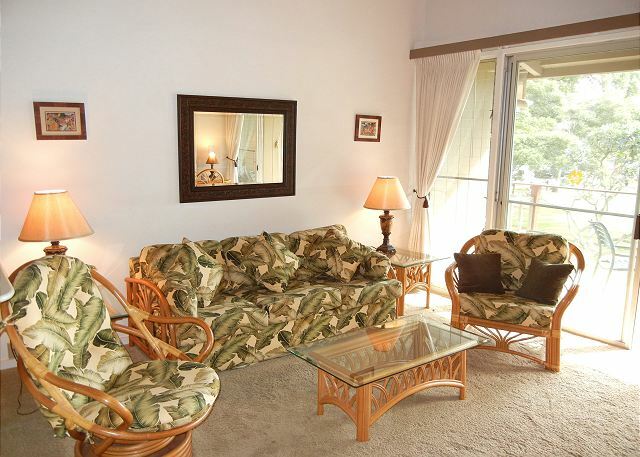 The location beside the park is wonderful and we had a great view of the sunset every evening from our lanai. The pool was a wonderful retreat every afternoon and we enjoyed sea turtles up close and personal as they sunned on the beach beside the Hale Kai. ( We stayed the correct distance away! 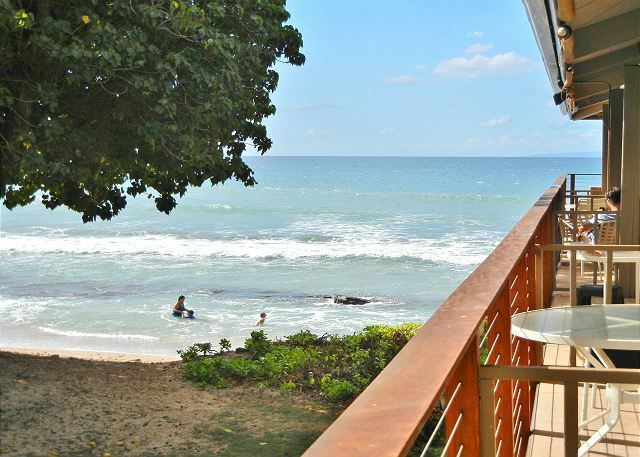 )Each stay at the Hale Kai has been memorable. 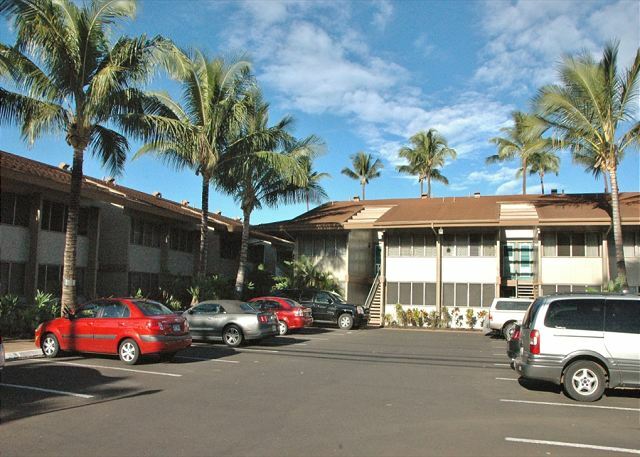 The Hale Kai is located a pleasant walk from shopping and restaurants. The manager was friendly and helpful. Thank you for a restful, fun week. The unit could use an upgrade. Having said that, I'd return to the same unit in a heart beat. Aloha, Yes Maui has that effect on everyone, 'we must return'. Mahalo until next time! We really enjoyed staying at Hale Kai, a lovely spot and very friendly people! The office staff were always very welcoming and helpful. We loved the sounds of the ocean waves and the birds. Unit 206 is nice, and exactly as pictured, but the bathroom needs a deep cleaning, especially the grout in the floors and the shower. The shower head also needs replacing. The kitchen was very well provisioned but could use a good cleaning as well, and the screen door falls off every time you open it. We did love Hale Kai, and would love to return but to a different unit next time. My wife and I just got back from our Maui Vacation. 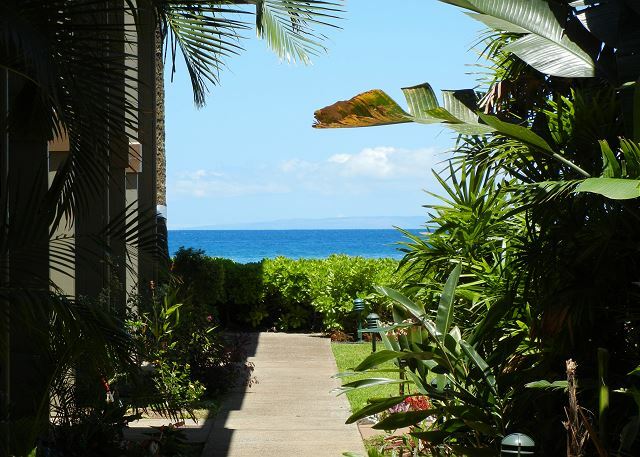 We very much enjoyed our stay at Hale Kai (#206). We found the location was great and the room was clean and comfortable. We arrived at close to midnight on our first day and were very releived that the room was prepared for our arrival. We look forward to returning to Hale Kai in the future. We had a great time at Hale Kai! Very nice and well equipped condo. Good property, nice and very friendly people! Definitely recommend Hale Kai for a stay on Maui. My husband and I stayed here for 11 nights and it was perfect for us. The condo is a little outdated in the style department but for the price and location, you will not find better. You can see the ocean from the lanai. 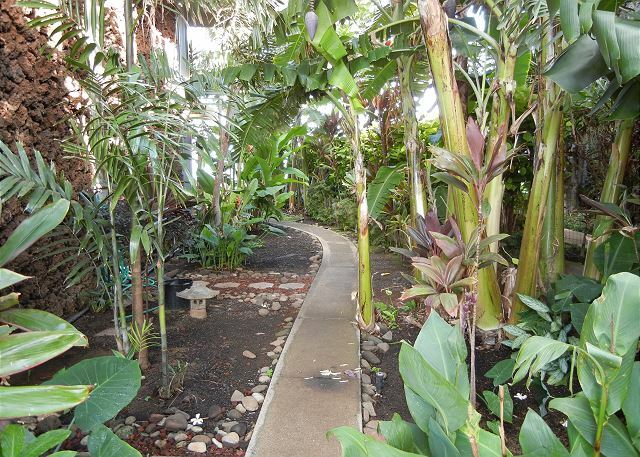 The lanai sits above a public park and is great people for watching. There is a small grocery store across the street and a strip mall within a few blocks with a full grocery store, shopping, and restaurants. The surrounding beaches are beautiful. There is no a/c keep in mind. The condo was very clean and had all the amenities you could ask for. The description and pictures on the listing are 100% accurate. People in the complex are very friendly, We felt secure. The pool area was clean and there is a bbq you can use. We saw multiple turtles swimming close to the pool area. I would stay here again for sure. We highly recommend this condo. very helpful in answering any of our questions. What am amazing place to stay! We absolutely loved it right from our lovely, professional Valerie who made us feel welcome and at home immediately to the comforts of the condo which was a highlight of our trip. We certainly recommend this place and are planning to stay again. Thank you! This was our third stay in unit 206 and eighth at the Hale Kai. 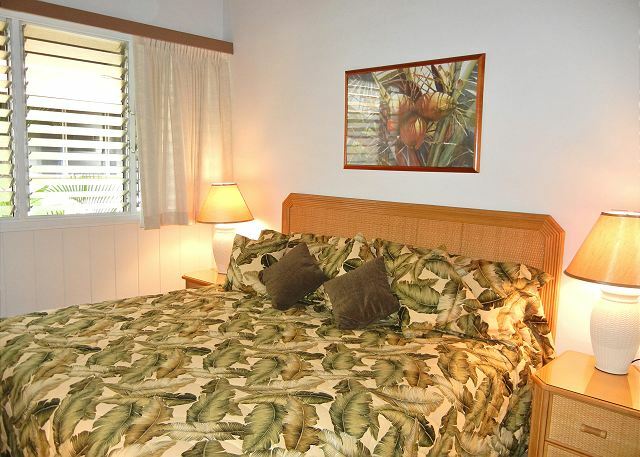 If you want the true Hawaiian experience at a reasonable cost this is the place to stay while in Maui. We really enjoy meeting our far away acquaintances each and every year. Just a fun spot. We had a thoroughly relaxing and enjoyable stay at Hale Kai. We loved the view of the ocean and the park from the lanai and also loved hearing the waves day and night. Loved Maui and loved having such a great place to explore from. In fact one of the trip highlights was watching whales and sunsets from Hale Kai. We had read a couple bad reviews of this condo so were a little apprehensive before we arrived. How surpised and pleased we were to find a beautiful updated kitchen with a wonderful stove. The bathroom, likewise was a pleasent surprise with a efficient shower, a great counter and plenty of light. everyone we met was friendly and helpful. Overall we so enjoyed our stay! This was our fifth stay at the Hale Kai on Maui. Our stay was very relaxing beside the ocean. Our unit was great and we are returning again next winter. Staff and returning Hale Kai vacationers are amazing. We love it and all our needs are met. Valerie is a wonderful host. We enjoyed the location of the condo, we watched whales and sea turtles right form our balcony. The Farmers Market is less than a block away and has a great variety. The pool area and barbecue grills were fantastic.